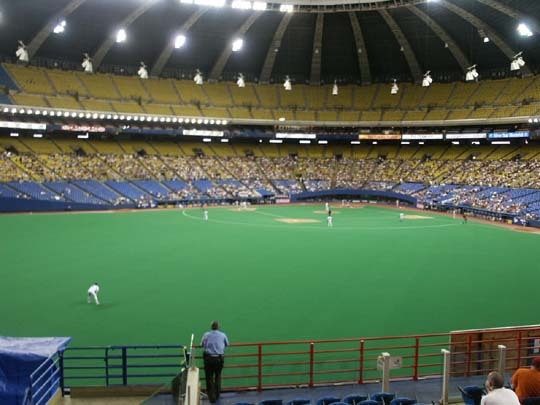 The Montreal Expos play in Olympic Stadium which was built for the 1976 Summer Olympics. We saw two games and the pictures are from the second game. 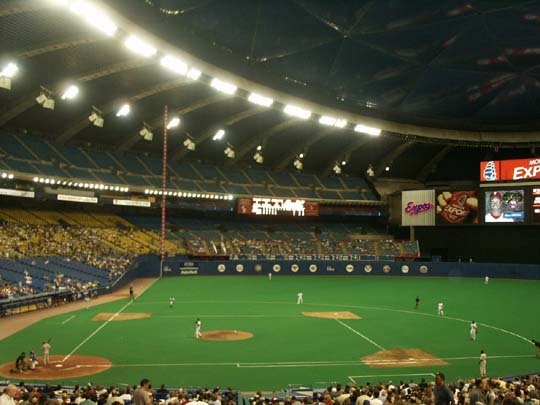 The Expos were playing the Philadelphia Phillies both games. 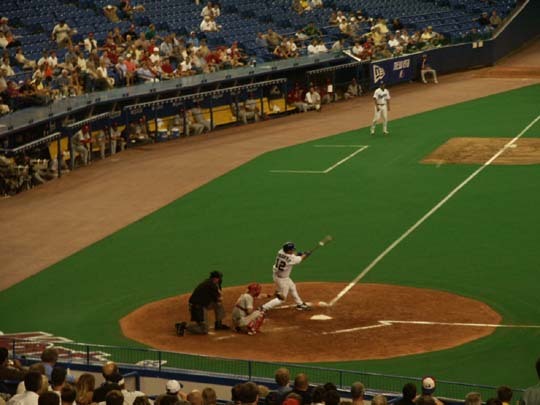 Livan Hernandez gave up one home run in winning the 1st game 7-1. 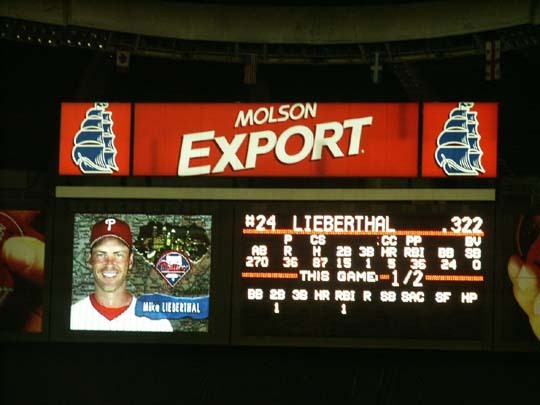 The box score was Phillies R-1, H-7, E-0 and Expos R-7, H-10, E-0. 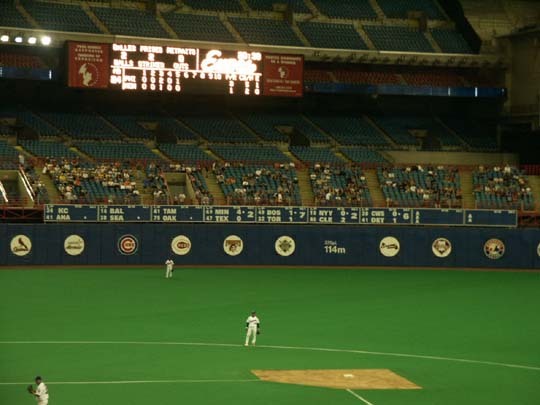 Livan was hit by a pitch and the dugouts emptied. 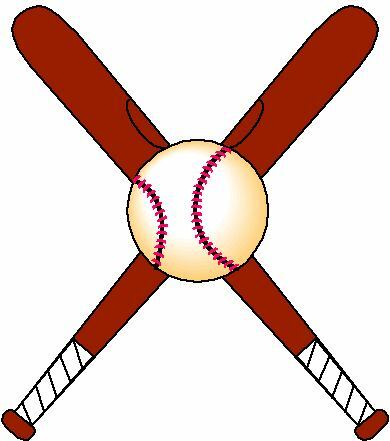 Larry Bowa, Phillies coach, was thrown out after the players returned to their positions. Livan went on to pitch a complete game with 10 strikeouts. The attendance was 7,099. 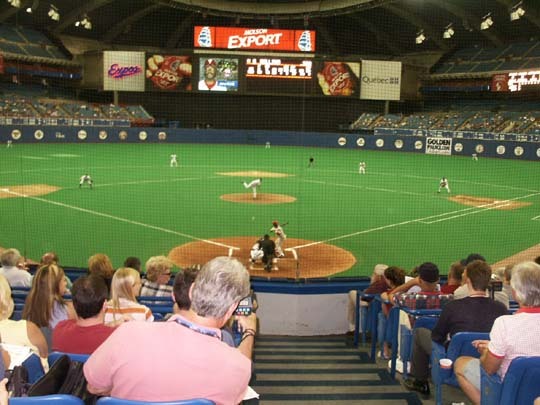 For the second game the Expos were badly beaten 13-6. 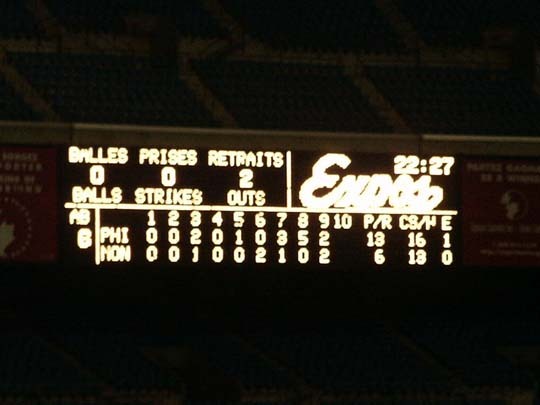 The box score was Phillies R-13, H-16, E-1 and Expos R-6, H-13, E-0. 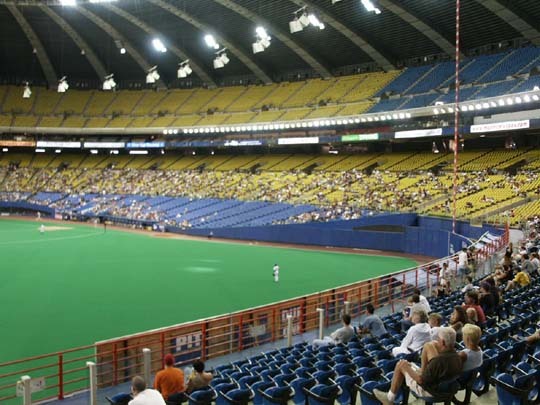 The Expos could not bring anyone home when they got their hits. 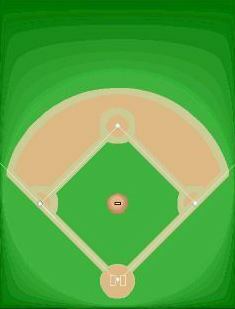 The field lines are RF-49m (325'), CF-123m (404'), LC-114m (375"0, LF-99m (325'). Tonight the attendance increased only to 8,225. 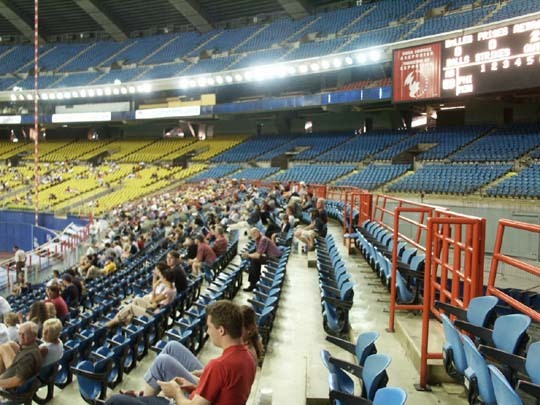 The seating is only on the lower level and then in only the two lower sections of this level. I'm not sure that they ever sit above these areas. The lowest level, blue seats, did not look even 1/3 filled at both games. 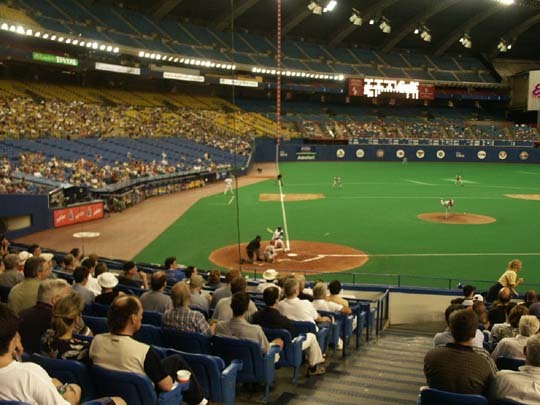 More people were sitting on the first base side, but then only out to the edge of the infield. 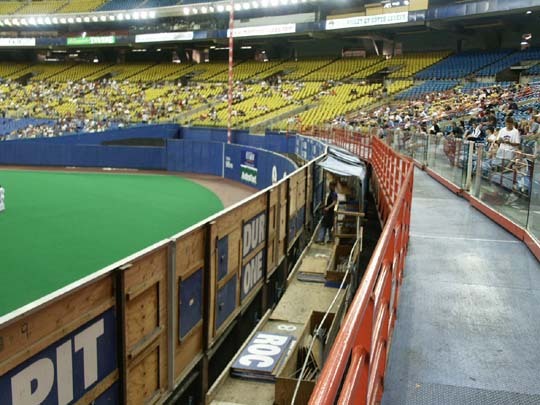 There were open seats behind homeplate both games. 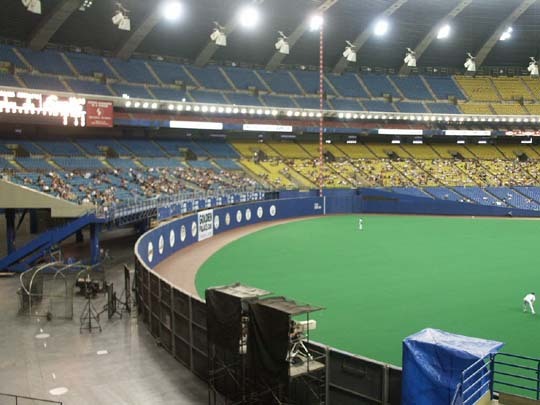 There are seats hidden behind the centerfield video board on the upper level that could never be used. Shown is a picture of the yellow seats. They are interesting in that the seat is molded and usually only has one arm. Also, they make great noise makers and are used regularly by the fans. The back moves slightly and the seat moves up and down. People either clack the back or stand slightly and clack the seat up and down. Either motion makes a lot of noise when you get several thousand seats going. There is lots of room between the seats which is nice. The out-of-town score-boards, RF-National League, LF-American League are hand operated. 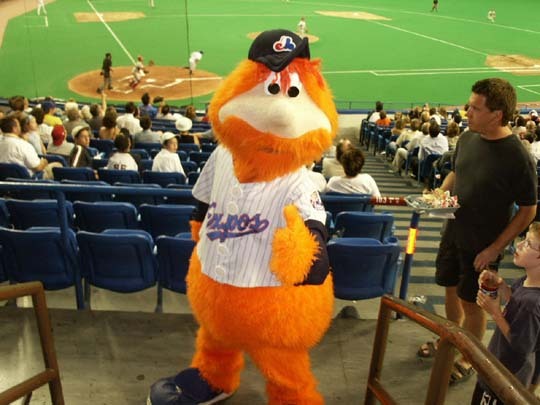 The mascot is Youppi and he is one of the best. Lots of interaction with the crowd and the children during the game. Trading cards packages involving current players were passed out at the second game. 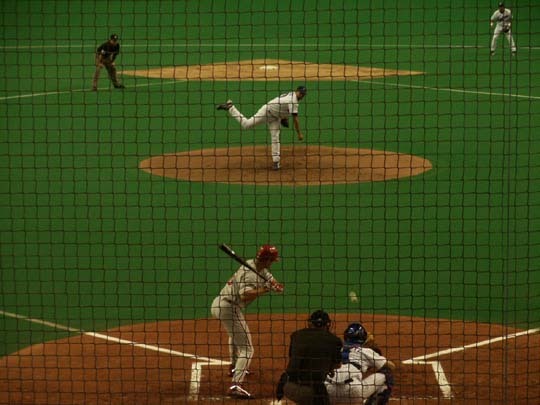 In 2005 the team moved to Washington, D. C. and are named the Nationals. The Old Fort and Stewart Museum - The Old Fort was built in 1820-24 by order of the Duke of Wellington. The fort comprises barracks, an armory, arsenal, blockhouse, powder magazine and the Steward Museum. 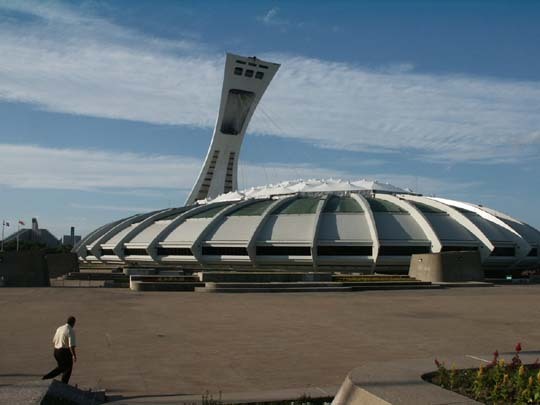 The museum displays military artifacts, arms and models relating to the history of Montreal and Canada from 1600 to the present. Fee. 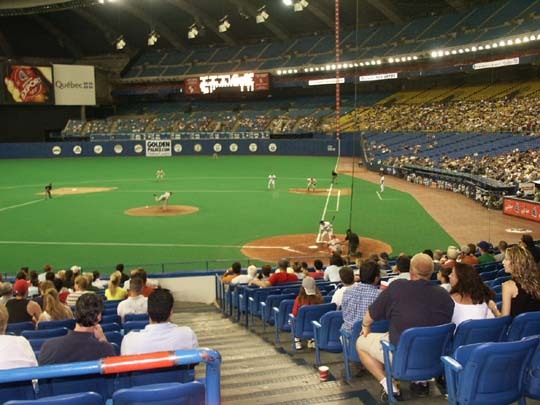 Montreal Museum of Archeology and History - A multi-medial show unfolds the history of Montreal. 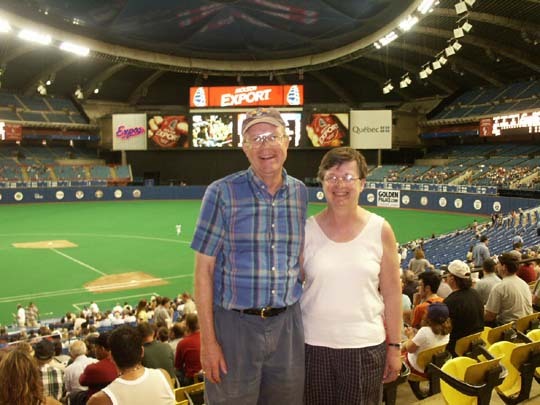 Highlights include visits to an excavated cemetery, an early Montreal sewer system and fortifications, as well as displays of artifacts that date back 1,000 years. Fee.